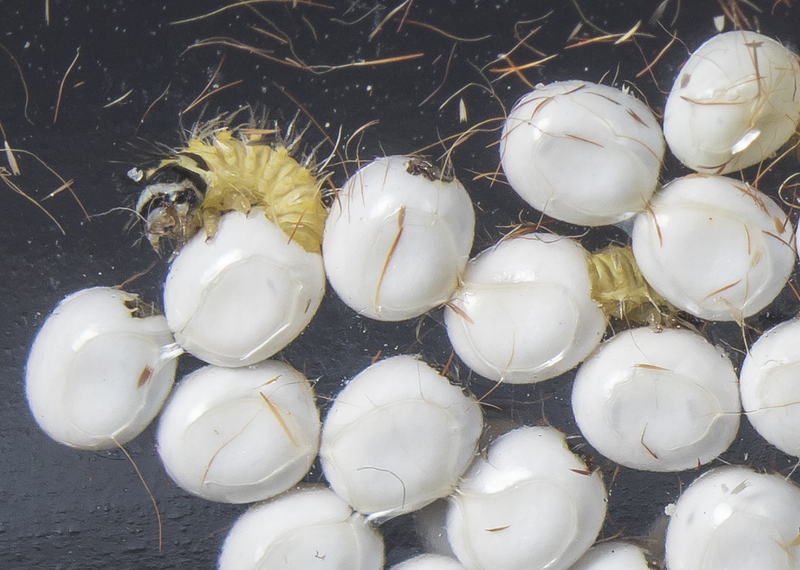 A quick update on the tulip-tree silk moth eggs from my last post – they hatched! The moth laid eggs inside the container on the night of May 19. They started hatching early in the morning on May 30. They hatched as a group and within about 15 minutes, they all had emerged. I placed a leaf of their host plant, tulip poplar, in the container and they all gathered along the edge and started to feed. This species feeds as a group in their early stages, then separate out and feed solo as they grow. 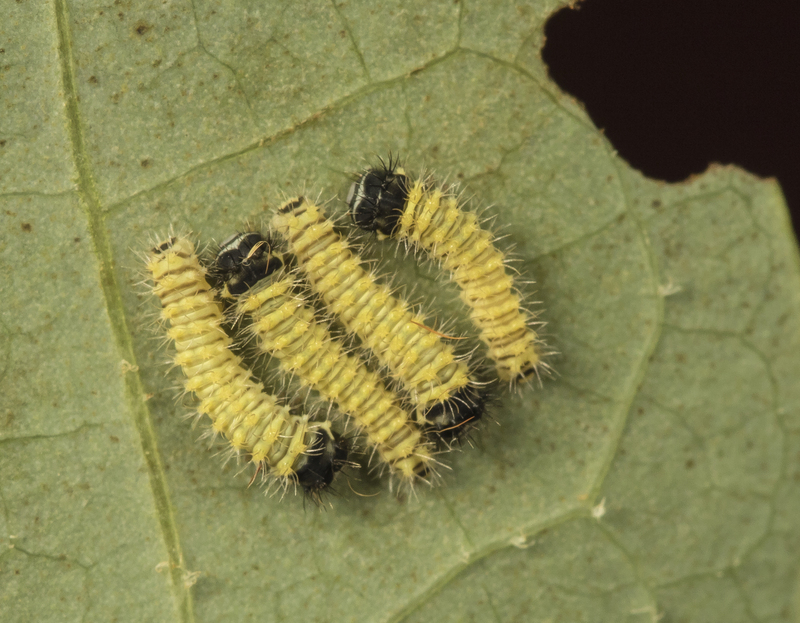 I have never seen the early instars of this species before, but references say these are often high in the treetops. 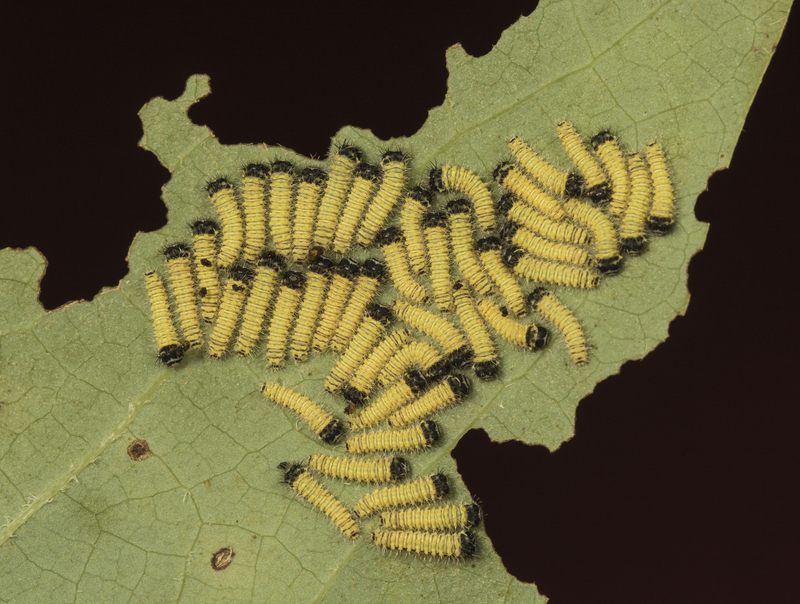 My plan is to release most on tulip poplar saplings around the Garden and here at home and then raise a few for programs (the above photo represents about half of the group that hatched). As I always do when walking around the yard, I was scanning the vegetation looking for anything of interest when my eye caught a small egg on top of a leaf. I leaned in and took a closer look and saw some beautiful patterns – I could see the creature inside the egg! 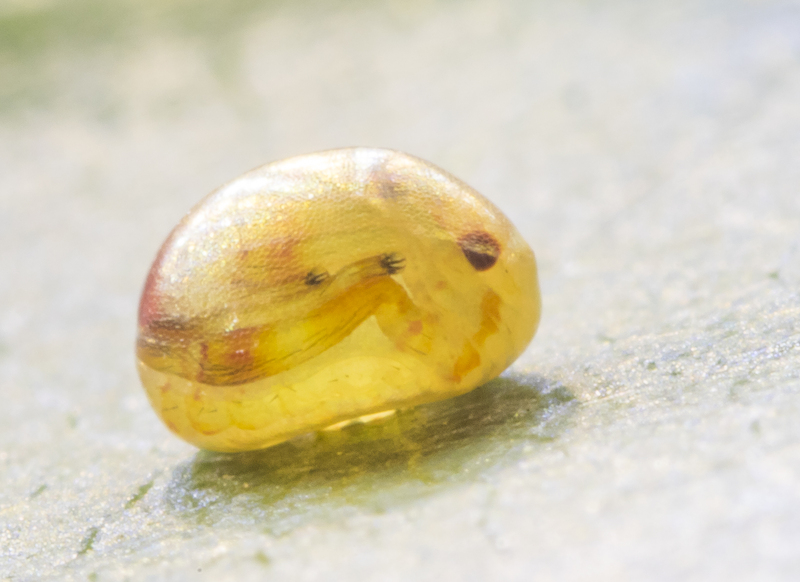 The egg was about 2mm long and contained what looked like legs ending in tiny black claws. There were some large dark dots, that I assumed might be developing eyes. I brought the leaf inside to photograph. The more I looked, the more it resembled a tiny alien from some sci-fi thriller. Ironically, I had found a similar egg the week prior on a hike at work as part of a citizen science program called Caterpillars Count. I had looked that one up in my go-to resource for such things, the excellent Tracks and Signs of Insects and Other Invertebrates by C. Eiseman and N. Charney. 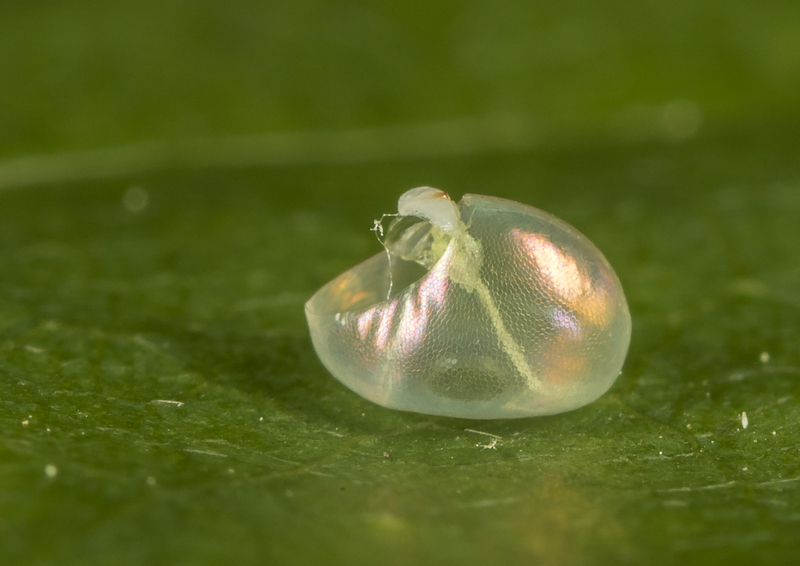 Both eggs closely resembled their photo of the egg of leaf-footed bugs. I decided to wait and see what hatched. I didn’t have to wait long. The next day, I took it to work to show a few folks, and while I was in a meeting (dang meetings! ), it hatched. It resembles assassin bug nymphs I have seen in the past, so that is what I first called it. 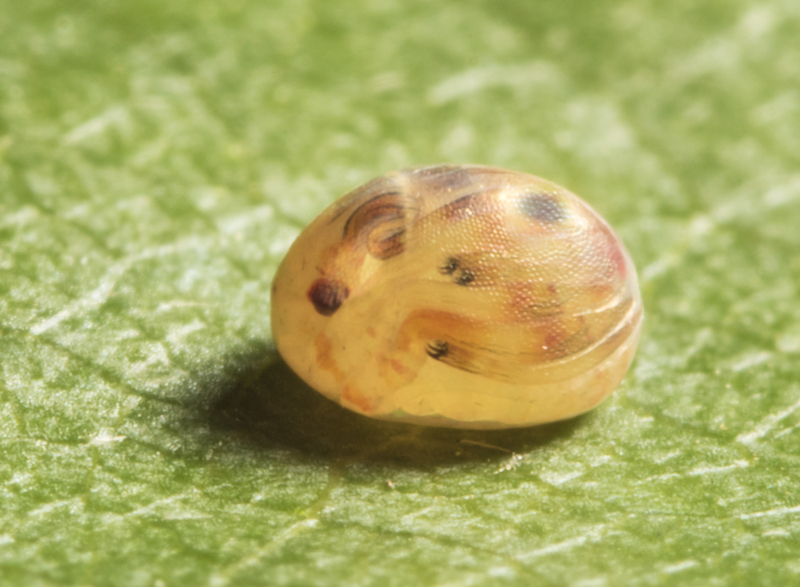 But, I looked up leaf-footed bugs in my other go-to resource, Bug Guide, and there were photos of my same egg and nymph. So, this little guy is in the genus Acanthocephala, and will grow into a large (30mm long) true bug that feeds on plant juices, fruit, and other plant parts. It has a lot of growing to do before it will look like its picture in a field guide. Once again, the world outside my door has proven to be fascinating and full of mystery and beauty. Guess I will be looking for more eggs in the coming weeks to see what emerges. This entry was posted in Natural History and tagged insect eggs, leaf-footed bug, tulip-tree silk moth by roadsendnaturalist. Bookmark the permalink. Thanks, Linda. I enjoy taking a closer look at the beauty and mysteries around us. Brilliant and beautiful, Mike. I’m showing this to everyone! Thanks, Gary. Amazing stuff right outside our doors! Thank you so much for rocking our world so consistently.